Mid October has finally brought the first rains of the season, as we say goodbye to the lovely, long late summer. Has there ever been a fall as gorgeous as this one? The extended fall has unfortunately enabled those evil white cabbage moths to produce yet another generation of their voracious offspring. 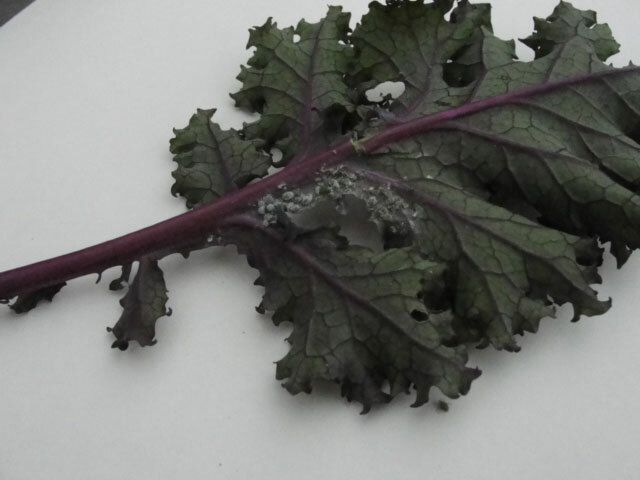 Even today, I found several of the green hairless caterpillars munching on the leaves of my Lacinato Kale. Oddly enough, the Red Russian Kale seems unscathed. I was away for 10 days! Aphids as well have had another chance in this warmth. Their veggie of choice appears to be the Purple Kale. If it’s not possible to blast them off with the hose, a good squishing does the job. 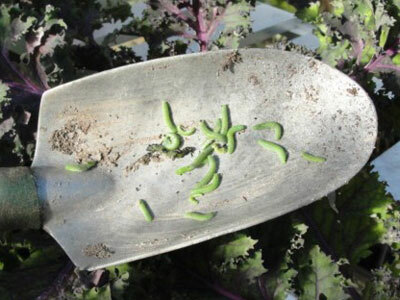 Keep inspecting both sides of the young leaves; while insects aren’t generally a problem for winter gardening, the young plants in a warm fall will fall prey to these very hungry munchers if you aren’t vigilant. At this time of year, there is no point adding compost or granular organic fertilizer, as the microorganisms that convert these organics into usable food for the plants are dormant. It’s a better idea to feed frequently with liquid organics, alternating weekly with fish and seaweed dilutions while the plants are still small. Any of the taller winter vegetables, such as Purple Sprouting Broccoli or Brussels Sprouts will benefit from staking; these are quite top heavy and subject to wind lash. Gather up fall leaves and mulch the veggies well, covering the soil with about 4” of loosely piled organic matter. When the storms of November toss piles of seaweed onto the beach, I like to bring some of this nutrient-laden bounty home, and add to the leaf mulch on my vegetable beds. By the way, next time you are at the nursery, stop by our working greenhouse by the driveway, and see the staff veggie garden all tucked in for the winter, and enjoy seeing it mature over the coming months. Swiss Chard, Kale, Spinach, Green Onions, Mache and Purple Sprouting Broccoli—what a feast!